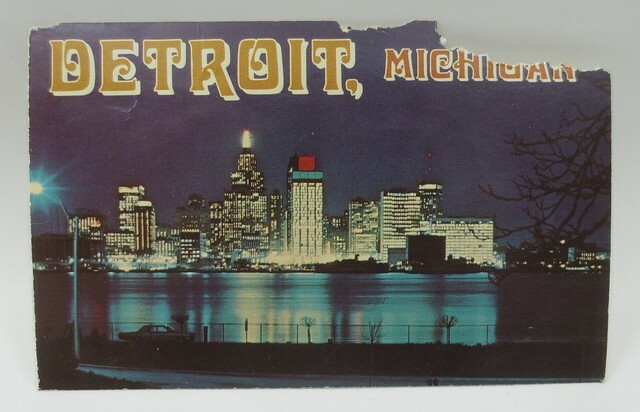 The city of Detroit made a big impression on me when we passed through on the way to visit my uncle in Canada in the early 70s. I’d been to Chicago, of course, because we lived close, and to Milwaukee, because that’s where my grandmas were, but Detroit was exotic and strange. I knew no one there; my mom and grandma knew no one. We stayed a night in nearby Dearborn on that trip, but with the exception of our visit to Greenfield Village, I have no postcards from that municipality, just from Detroit, the alluring big city we drove through to get to the tunnel to Canada. We did not fly in, yet I saved a postcard of the airport, showing the L.C. 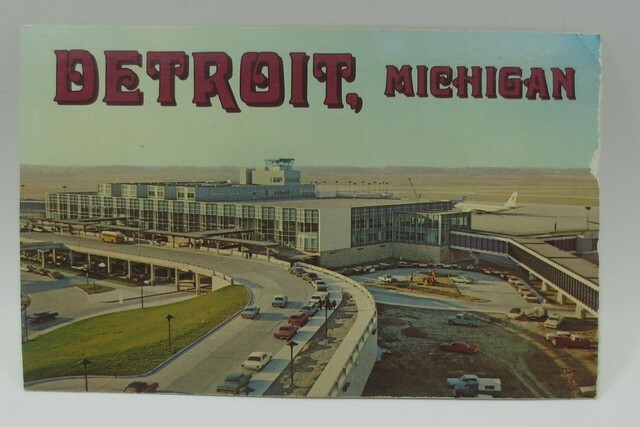 Smith terminal, which the back of the card tells me “…has undergone a $50 million facelifting and now ranks as one of the foremost jet-age airports in the country”. I had no idea I’d one day live near that airport and fly out of and in to that very terminal many times. 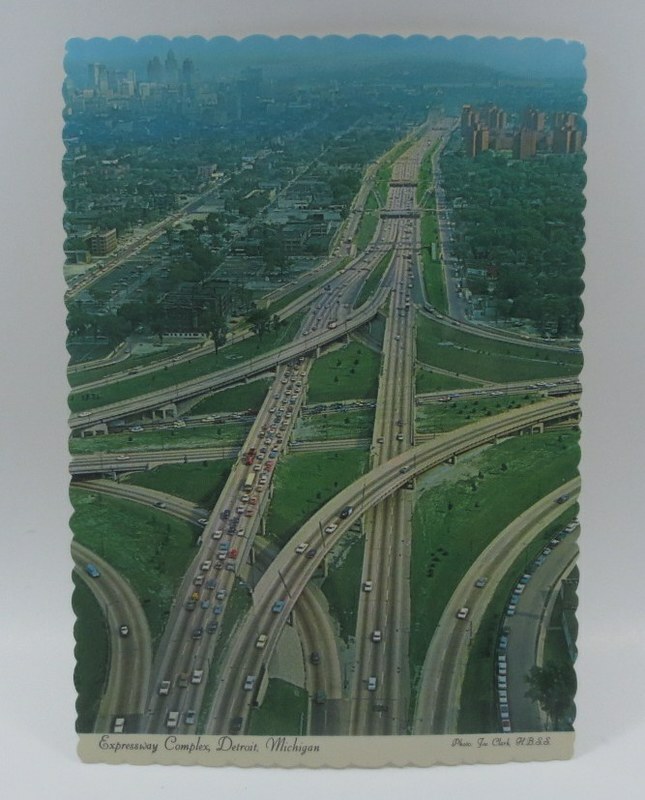 My note on the back of this card showing the junction of the Lodge (M-10) and the Ford Freeway (I-94) is “How’s this for a network of roadways!” I don’t go through this interchange all that often, but am on other Detroit area freeways every work day. Tonight, the 696/275 ramp I wanted to take home was closed due to numerous spinouts from icy conditions. 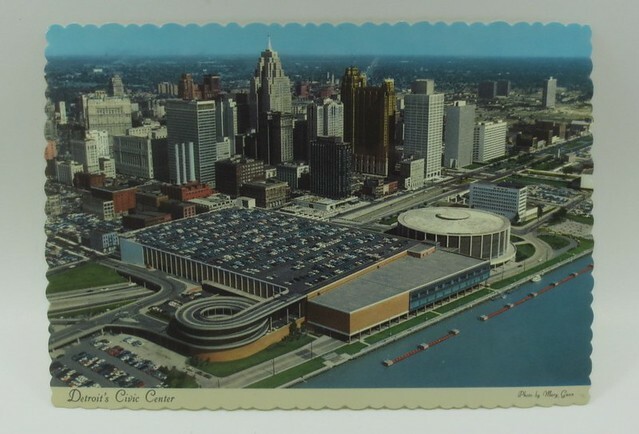 Cobo has expanded a lot since this postcard photo was taken in the mid-60s, and the Renaissance Center and Joe Louis Arena were built along the riverfront. 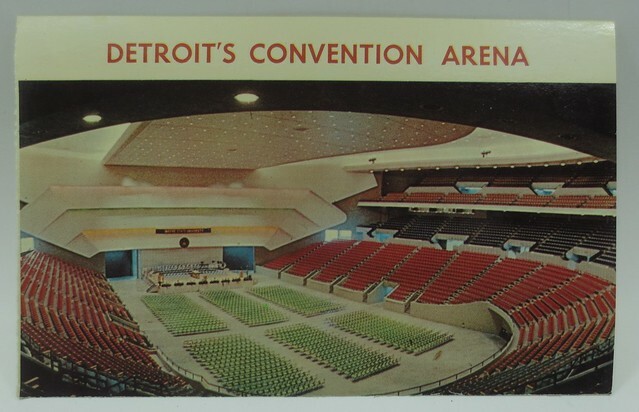 My note on the back of this card showing “Detroit’s Convention Arena”—what I knew as an adult as Cobo Arena—says “A good place for a balllet” (I was ballet-crazy at that age). I never saw a ballet there (I don’t think there have been any, what with the Opera House and other theaters nearby), but I did see Mr. Karen get his master’s degree in that very hall decades after I bought this postcard. The description printed on this card tells me that this photo was taken during an event called “Night Aglow”, which “…launches the ‘City Beautiful’ on its festive holiday season”. I don’t know when this stopped, but we sure don’t do it now. There are some buildings with special lighting for the winter holidays, but not the whole skyline. Too many empty and underutilized buildings for that now. I think I owe it to that girl who wanted to see more of Detroit to spend some more time exploring it in the present day.